My mother outlived my father by several years, and when she died, my sister and I faced the sysyphean task of cleaning out their house. This included going through my father’s shop in the basement and in the garage, where he did everything from making wooden lamp bases on his lathes, to machining new parts for his car, to carrying out scientific experiments. I’m fairly certain that he never threw anything away. Nothing. For my sister and me, each decision to keep or discard bore an emotional weight that devastated us both. It took some months, and we were weary in heart and soul both during the task, and for a long while after. Frankly, it would have been much easier for us if my parents had followed the modern art of “tidying-up”. But if they had, so much would have been lost. But the reality is that we couldn’t keep it all. So painstakingly, emotionally, and exasperatedly, we combed through the house as if it were an archeological dig. And, in a way, I suppose, it was. 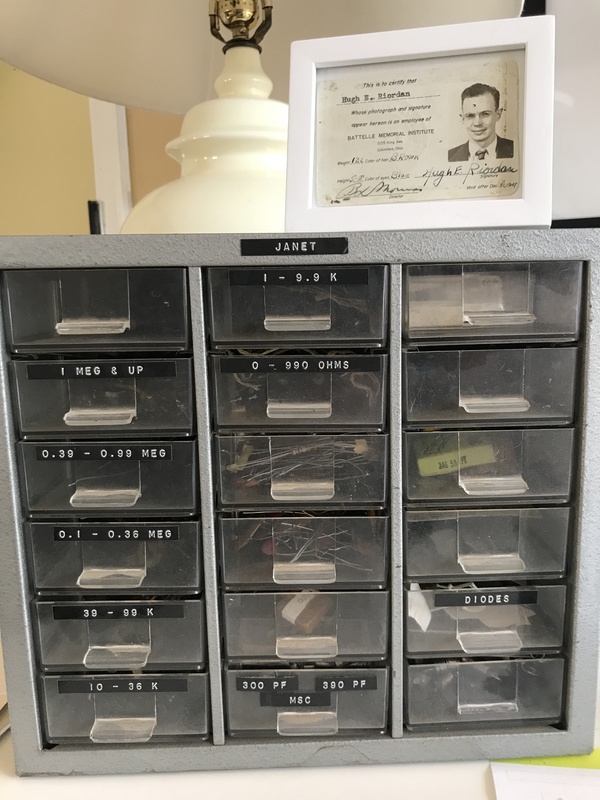 Among the things I found was a dirty metal file box with little plastic drawers for sorting diodes, resistors, and transistors and other early electronic parts. The box had stood on my father’s workbench for as long as I can remember. At the top was my name, printed out in the same style as the labels on each drawer. I remember the day my name came to be on that box. I was about three, and my father had received a new gadget in the mail: a label maker that used long flat spools of plastic to impress letters on. It was an exciting thing. I remember my father showing me what it did by painstakingly printing out the letters of my name, and then pasting the result at the top of the box. Seeing that box on his workbench, years after his death, brought me fully back to that moment. I remembered the smell of cut metal and wood, the difficulty of seeing the top of the bench unless I were given a little stool to stand on. I remember my pride in seeing my name on the top of that box, and mostly, I remember being loved as clearly as if I had been embraced. There is a–by now–somewhat aging trend in the world of home interiors known as “tidying up”. The process, which is a method of decluttering and living a minimalist life, has an almost spiritual quality, in that it claims it will change your life, and its adherents have the tone and enthusiasms of Nineteenth Century evangelists. There is a vaguely moralistic and superior tone taken by these doyens of home organization. They are the new Puritans. No one needs stuff. No one needs other people’s stuff. It is clutter. It clutters your home and your life. In this age of materialism, when we all have bulging closets, attics, basements, and enough stuff to create another entirely separate household, people’s interest in the process is perfectly understandable. But, had my father not kept his old things–radio parts that were no longer needed by any working radio–my memory of the label-making would have been lost to me, for there would have been no material thing in the world to remind me of it. That moment would have been lost to me forever. This is the value of things, perhaps, even, of clutter. It is memories that make us who we are; which haunt us; which enrich and warm us; which remind us of how to be better. And the things, they are the memory triggers. They bring back the moments we might have forgotten in the depths of time: of my mother in her kitchen, or cutting off a button thread with her teeth; my grandmother combing her hair, of picking her up at the bus station and sitting next to her in the car, touching the softness of her fur coat; my father listening to opera at high volume while he worked on his car. These are moments that form us; that make us ourselves. I will admit that I have kept too many things. We jokingly refer to our garage as “the home for wayward chairs.” I have much of my parents’ good mahogany furniture, their wing chairs and their china cupboard. I have my grandmother’s vanity. I have all my father’s designs, and the paperwork for his one hundred twenty-something patents. It is a lot, and it can be overwhelming sometimes. But I’ll take clutter any day. It is the price of remembering how it felt to be a little girl who was loved by her father. Thank you for sharing this Jan. Your way with words puts my emotions into place. It brings them to the surface…. that’s what I am feeling. Someone else gets it too! Beautifully stated. I am writing as tears roll down nny cheek. Oh my! I am a classic collector of clutter…. and can relate so well to your story. We recently had to clear out our parents home of 56 years and it’s quite an experience. In a similar way, I just sold off a lot of my “Wizard of Oz” costumes yesterday and it was really hard to let go of so many memories. I could recall who wore what and in which of my 4 Oz productions they had worn it. But it’s also great to know that these outfits will live on and spread joy to an audience and I don’t have to do any of the work… I can just sit in the house and enjoy the show. Oh my goodness Jan, this writing brought so many memories for me. Like you I was also tasked with cleaning up the memories.. I guess that I shouldn’t say tasked, I should say honored. Heartbreaking yes, but I would do it all again in a heartbeat. Sitting at my computer, working on a blog post about this very subject, I serendipitously stumbled on this post. It’s been two years since my siblings and I faced this same daunting task, but it feels like yesterday. You captured the difficulty and tenderness of this life milestone so beautifully. Kudos! Clutter is not clutter if you from time to time you move things around so it looks different. Very well said. Wow! I love this!! It took me straight back to going through my own father’s workbench after he died. My mother and I found things we never knew were there – and – oh – the memories!! All the little Christmas gifts I had made for him at school…an ashtray (he wasn’t a smoker) where he kept coins, etc, and a small piece of decorated wood with small hooks that he hung up on the wall above the bench – where he could hang his various tiny keys. There were old Fortune magazines that he had subscribed to when I was selling magazines for a fundraiser. It was fascinating looking at his work area – it represented everything I remembered about him. It told his life story. Thank you for this tearful walk down memory lane! Thanks for your kind remarks. This seems to be a nearly universal experience. Lovely sentiments! Mom – now 92-lost the family New Orleans home in Katrina. I am SO happy I took many things back with me to New Jersey over the years. I will keep them over newer “stuff” forever. It is so hard to get rid of what others call “clutter”. I have many things that are of no value to others but hold so much for me. I did put money in my books and papers so that my daughters will need to go through every piece! I hope by the time I no longer need them, they will mean something to my daughters. Thanks for your poignant essay and the memories it brought. Very touching! Something most of us go through and hate. Well written. So beautifully stated. Amen. There is a spiritual resonance left on a “thing” by which two souls have connected. Thanks. Powerful. Thank you for writing this. A couple things more that I found: his baby ring in his basement toolbox. A scrawled piece of paper that contained the details of the inscription on his grandmother’s gravestone, written in his father’s hand (he died in 1927, and we had no idea where our greatgrandmother was buried. )… Myriad small things that were so memorable to me: the tiny globe pencil sharpener he kept on his desk; the little cast iron greek horse that he bought in Brentano’s bookstore when I was in 6th grade; the red wooden dachshund that held toothpicks in its back for shrimp when you had company for cocktails…etc. Several stained and notated cookbooks my mother used so often. Each object has strong memories that are pieces of my heart. Who could declutter such things? And now that my daughter has her own child, I am so pleased she wants the baby clothes, the toys, the books of hers that I saved. The precious memories of her childhood that she wants to share with her little girl. Irreplaceable! That does sound hard. How did it all turn out? You would understand then how torn I was as I “downsized” after 24 years in the house where we raised our six children. My husband had decided that he wanted to go to seminary and become a pastor for his second career. I told him that was wonderful but it would make me a pastor’s wife, which was not on my bucket list even though I had been a Christian all of my life. There were times when I thought the same thing your sister said, “I am throwing me away!” I had to say out loud several times “I am not my stuff” but still it was a very hard period of my life. Great piece. Brings back wonderful memories of my childhood days as well. Thanks Phee. Beautiful heartwarming article. It is such a great feeling to be that little girl, even in just your memory!!! I’m still going through things left behind by my parents, who died in 2011 and 2015. I had to throw out so much…and it broke my heart. Recently, I brought up a bag from the basement, that I thought had only some solar or motion detector lights in it, but discovered that one of the boxes had a bunch of this n that in it, among which was a ladies’ pocket watch – one that I guess I’d found among dad’s stuff way back. I opened the watch again, wrote down the numbers in it, then looked online for Elgin watches and discovered that there’s a place where you can find your one specific watch – this one was made in 1911. I got thinking, maybe my grandmother was given this watch when she turned 21, since she was born in 1890….or maybe it was a wedding gift, as there’s a faintly scratched H in one of the embossed shields. I looked in the family history – June 14, 1911 my grandparents were married. I sure wish I knew the history.